Formed in 1996, the Florida Highway Patrol Command Officers Association provides representation and services for Command Officers, Lieutenant and above, of the Florida Highway Patrol. The association is governed by a Board of Directors who are comprised of active command officers from each of the 11 troops. The Board of Directors elects an Executive Committee (President, Vice-President, Secretary and Treasurer) who attend to the day to day operations and commitments of the association. 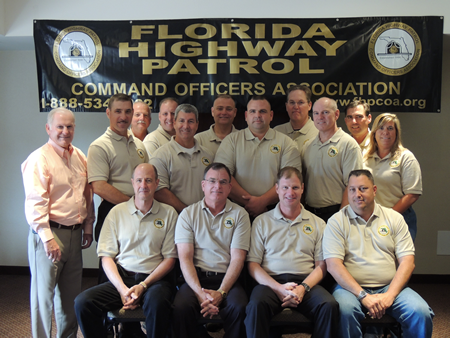 The Executive Committee members are also active command officers of the Florida Highway Patrol. All serve the association for the betterment of all command officers and the Florida Highway Patrol. The rank and file (troopers, corporals and sergeants) are not included in this association because they are represented through the collective bargaining process. Collective bargaining does not include command officers. This association secures its funding through membership dues and fundraising campaigns. Although we are an organization comprised of command officers from the Florida Highway Patrol, we are not funded by the FHP. Funds raised during fundraising campaigns go toward membership and professional services, and to secure benefits for the membership. Copyright © 2010 Florida Highway Patrol Command Officers Association, Inc.